Gonzaga has been the No. 1 team in the country for six days now and finally have the chance today to actually, ya know, play a game with a little #1 next to their name on TV. The Zags are down in Las Vegas for the West Coast Conference tournament, which has already gotten weird. As the #1 seed, GU received a bye all the way to the semi-finals, but the tournament has been going since Wednesday. The lowest-seeded team in the tournament, Loyola Marymount, went 1-15 in conference play and skidded into Vegas having dropped 14 games in a row. But then the Lions showed in Sin City and beat Portland, San Francisco and then stunned Santa Clara last night to reach the semifinals. Consider this the first Cinderella run of March. While the Lions have been the darlings of the tournament, they go into tonight's game (6 pm on ESPN2) as 20-plus-point underdogs. The Zags, who've been resting for a week, will go up against a team playing its fourth game in as many days. 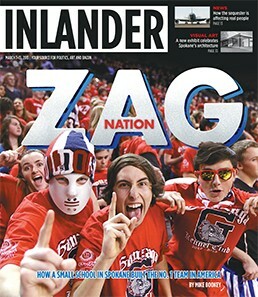 Full disclosure: While I did pen this cover story about Gonzaga basketball this week, I'm actually an LMU alum and an LMU hoops fan — a distinction that up until this week has been a gruesome burden to bear. Please don't hate me for this, Zag Nation. In other news, San Diego upset BYU in the other quarterfinal game, meaning that St. Mary's will play USD tonight after the GU/LMU matchup. Again, this tournament has been a weird one. Kelly Olynyk's Amazing BigTime Comeback™continues to earn him accolades. In addition to raking in the WCC Player of the Year award earlier this week, news came out today that the Canadian big man was named a finalist for the Wooden Award. The list has been whittled down to just 15 players and Olynyk is one of those remaining. The award, given to the best player in basketball, will be announced at the Final Four in Atlanta. According to ESPN's Bracketology page, the Zags remain set to receive a #1 seed for the first time in program history. As of now, it looks like they're likely to play their first round games down in Salt Lake City in two weeks. Of course, that's if they take care of business down in Vegas.